On Halloween, hundreds gathered into a banquet hall at Embassy Suites and Conference Center in southeast Noblesville to hear an update from Mayor John Ditslear. 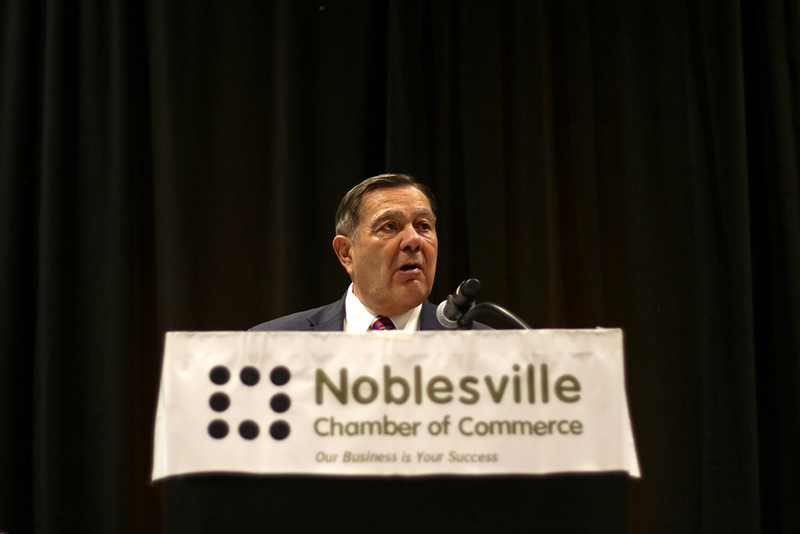 His annual State of the City address is hosted each fall by the Noblesville Chamber of Commerce, but this year the event saw a change, as it’s usually held in the opposite corner of the city at Harbour Trees Golf Club off Carrigan Road. Two years prior, Deputy Mayor Steve Cooke was touting the Embassy Suites project at the State of the City address when he filled in for Ditslear. At that time, the city had just broken ground on the project that now houses more than 25,000 square feet of meeting space. The annual address covers the city’s accomplishments of the past year while also highlighting upcoming projects. Ditslear began the event by talking about a change to the Noblesville Common Council, where Darren Peterson was elected by a special caucus to replace Mary Sue Rowland, who resigned in September. But downtown projects and road enhancements were the theme throughout. The Levinson was introduced to the Noblesville Common Council earlier this year and is the city’s solution to adding more housing and more parking in the heart of downtown. Although some residents worry its scale and design is not consistent with the downtown landscape, the council approved the project. A rendering of the Logan Street Pedestrian Bridge shows the completed project looking north up the White River, just west of the Riverwalk and Hamilton County Government and Judicial Center. Drivers have likely noticed significant construction work at one of the city’s busiest downtown intersections – Ind. 19 and Logan Street. The northbound lane of Ind. 19 from Ind. 32/38 to Logan Street has been closed for several weeks and lane restrictions in the eastbound lane of Logan Street on the bridge have been in place to complete the construction of the Logan Street Pedestrian Bridge. A joint project between the City of Noblesville and Hamilton County, the bridge’s aesthetic will match the Riverwalk’s. The city is planning to widen Olio Road from 141st Street to just north of 146th Street to four lanes. Other improvements along the stretch include a new roundabout and sewer and drainage enhancements. City officials said adding sewer service in the area will open up approximately 125 acres for development. The roundabout at 19th and Pleasant Streets opened last week. 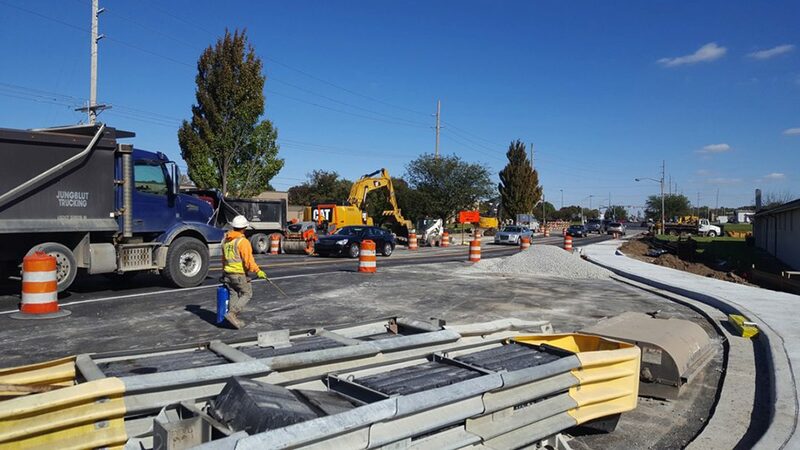 Construction on the roundabout at 19th and Pleasant streets by the Post Office and fairgrounds was completed last week. Ditslear said the project will greatly increase safety at the intersection and general traffic flow. The change at the intersection is one step toward the city’s plan to extend and widen Pleasant Street and change its intersections to roundabouts. The city has not set a timeline or identified funding for the project. Looking ahead, Ditslear said work will move to the intersection of 16th and Pleasant Streets but construction won’t begin until 2020. During the summer of 2019, the city will build a roundabout at Field Drive and Cumberland Road near Noblesville High School with money from a federal grant. Because of construction in the area, the city’s Fourth of July celebration, which is normally at the NHS campus, will be moved to Forest Park. 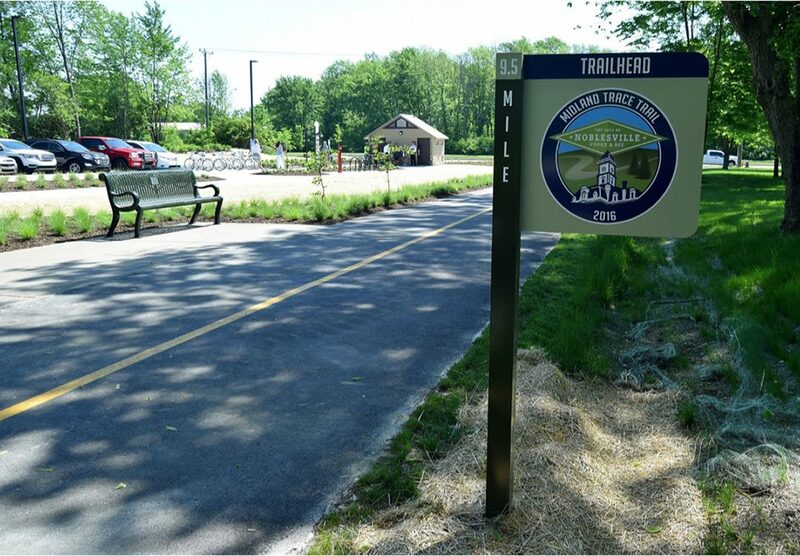 This year, the city completed extension of the Midland Trace Trail to Willowview Road, and a trailhead was built and opened at Hazel Dell Road. So far this year, the city has invested approximately $250,000 for improvements in its parks. Ditslear also spoke about the Noblesville Police Dept. recently being re-accredited, meeting more than 189 standards. Ditslear said crime also is down in the city.